I was hungry, didn't feel like doing any real cooking, and was out of peanut butter, so I grabbed an avocado and started pretending like I knew what to do with it. Fake it 'til you make it, they say. They're smart. 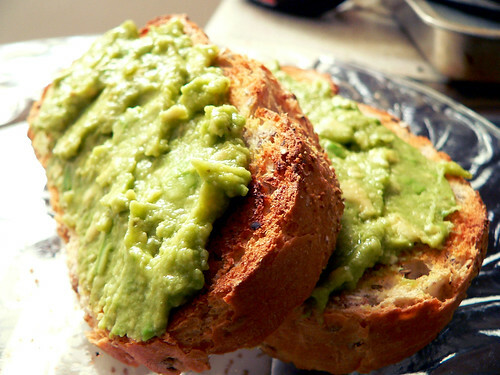 The avocado is best if its skin has turned very dark and is a bit soft when squeezed. That means that its insides will be easily spreadable. First, I melted a tablespoon of butter in a bowl in the microwave. 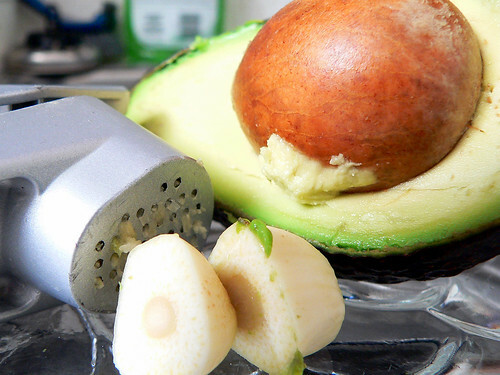 Use a bowl that will be able to handle an entire avocado plus a few other small ingredients. You don't really need the butter, but butter makes everything better. I'd rather die a couple of years early than live a life without it. I used a garlic press to crush two huge cloves of garlic into the melted butter. Then I chunked the avocado into the mix, minus the skin and pit, of course. 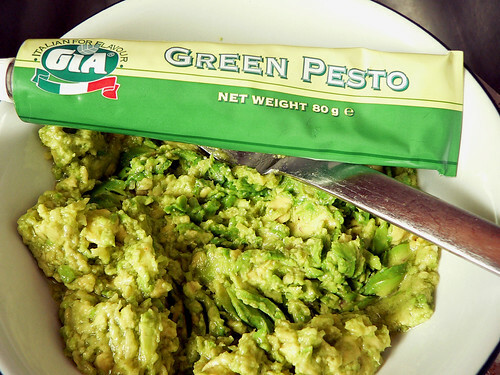 Then, I threw in some basil pesto, maybe a teaspoonful of it. This whole thing is done to suit your personal taste, so you can use as little or as much as you want. Lemon juice really brightens up the flavour, because avocado is a lot of things, but it just isn't zingy. 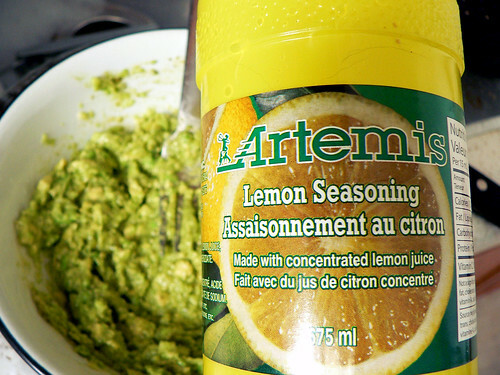 I used about a tablespoon of lemon juice, but, again, use as little or as much as you like. Mash it all together with a fork. Voilà! I put mine on whole grain toast, but I'm sure that it would be good with tortilla chips, in burritos, on baked potatoes, or in sandwiches. In hindsight, this lemon garlic mockamole might have benefited from some chili powder and maybe a dash of cayenne pepper, and, hell, why not some parmesan cheese? Nonetheless, it's been a good thing with which to snack away the afternoon, and since I've got some potatoes on hand, I think I'll bake a couple and try out the mockamole on them.